OTTAWA, CANADA - Eurocom Corporation has launched two super fast and super powerful notebooks, the EUROCOM 8880E Dream Machine II and the EUROCOM 5600D Monte Carlo II, offering unrivalled power combined with stylish design and unsurpassed features. Featuring the latest in computing technology and powered by the Intel® Pentium® 4 processor up to 3.06 GHz with 533 Front Side Bus and the high speed USB 2.0, the second generation of EUROCOM 8880 and 5600 line is truly excellent. Sleek and beautiful, the new EUROCOM 8880E Dream Machine II and EUROCOM 5600D Monte Carlo II notebooks are a perfect solution for professional users who are looking for quality in design as well as power and features. The two new models offer customers excellent performance in all-in-one fully configurable and upgradeable design. The 5600D model is the most stylish and powerful all-in-one system, while the seven-spindle 8880E model is the most complete desktop replacement notebook available on the market. Truly luxurious and more powerful than ever, the two new EUROCOM notebooks bring back pleasure to computing. Featuring a whole new 533 MHz system bus architecture, the two EUROCOM models support Intel® Pentium® 4 processor up to 3.06 GHz. Powerful ATI Mobility Radeon 9000 graphics engine with 64 MB DDR video SDRAM brings pictures to life on the very high contrast LCD screens: large 15.7-inch SuperXGA with up to 1280 x 1024 resolution on the 8880E model and SuperXGA+ or UXGA LCD screen with up to 1600 x 1280 resolution on the 5600D model. Up to 1 GB of 200-pin 266 MHz DDR SODIMM DDR SDRAM coupled with the powerful graphics dramatically raises the bar for the systems' 3D performance. Over two hours of battery life with the primary battery, and a hot swappable secondary battery available on the 5600D model extend the usage time and ensure continuous performance. Two optical drive bays that support a choice of optical drives such as CD-ROM, DVD, CD-RW or DVD/CD-RW Combo, allow for data backups and creation of extra copies of audio/photo CDs directly between source CD and a blank media bypassing the Hard Drive. Depending on your configuration choice, you can watch a DVD movie while burning a CD. An internal built-in 3.5-inch floppy drive is standard on the 8880E model, while on the 5600D the optional modular floppy drive is swappable with a second optical drive or a secondary battery. The front panel audio DJ CD Player Control with separate power switch allows playing favourite audio CDs or MP3's on both models even when the notebooks are shut off. A detachable SD Memory Portable Storage unit with a MP3 player module, available only on the 8880E model, allows for transferring large files with USB between the notebook and other systems. The MP3 Player module lets a user take his favourite music on the go. The 8880E Dream Machine II also features a Sony Memory Stick slot for swapping files with similarly equipped Sony devices, such as a digital camera for example. An optional built-in TV Tuner with a coaxial cable TV-in port, supported only on the 8880E model, offers even more entertainment on the go to those who enjoy watching TV on their notebook. The keyboard on the 8880E model is a 102-key real desktop like keyboard with a separate numeric keypad. The 8880E notebook includes five built-in Easy Start Buttons and one button for instant retrieval of new email received. The 5600D model features three instant keys for internet, emails and the CD Player. By simplifying common tasks, these extra buttons help users to save time and increase productivity. Both notebook models come with four USB 2.0 ports, IEEE 1394 FireWire, 10/100 Fast Ethernet, 56K V90/V92 Modem on-board and a built-in standard antenna for 802.11a/b wireless LAN. 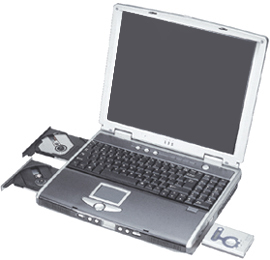 They offer all standard ports such as one serial and one parallel port, one PS/2 port for external keyboard and mouse, one port for external CRT monitor, one S Video port for TV Out, one for CardBus PCMCIA, one port for security cable, one port for Microphone-in, one headphone port, one SPDIF port for digital output and one internal miniPCI slot. Optical digital SPDIF output (5.1CH for DVD movies) on the 5600D model combined with the TV-OUT port output at 1024 x 768 resolution allows users not only to watch DVD movies on the road, but to hook the notebook right into their Home Theater system. The S-Video In for a video camera and Coaxed cable TV In port with optional TV Tuner combined with the Optional internal IP Sharing Module for ADSL make the EUROCOM 8880E the most complete desktop replacement notebook available on the market. The EUROCOM 5600D Monte Carlo II and the EUROCOM 8880E Dream Machine II are the best fit for professional users who look for a complete portable computing solution in a luxurious package. Both notebooks are engineered for performance, long-term stability and service ability. Outstanding performance, high graphics capabilities and overall functionality coupled with a beautiful, stylish design, make the new models the most desirable notebooks.